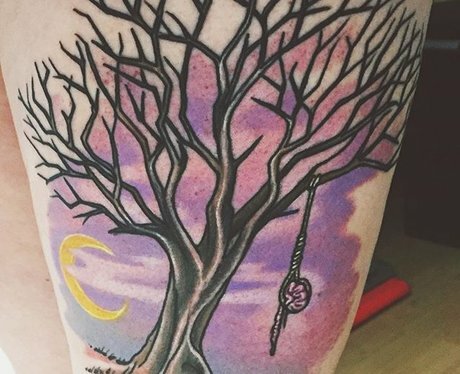 @katelynnicole's "Holding On" inspired tattoo is just about the prettiest thing we've seen all day. Can't. Stop. Staring. "As of yesterday, I have a part of the band that has saved my life with me forever." First of all, ankle tats are cute AF. Second of all, what a perfect way to take TØP with you everywhere you go. Everything about this tattoo is actual perfection. "Thank you for holding onto me @twentyonepilots"
"I look at my tattoo every day and love it more and more. It holds incredible meaning for me." "A tribute to a band that has meant more than words to me. @twentyonepilots I thank you for all you've done to help us proud few in the daily fight to stay alive." "Death inspires me like a dog inspires a rabbit". STOP. This is too nice. Are Twenty One Pilots About To TØP The Charts?